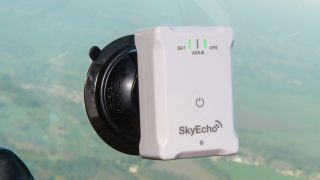 SkyDemon users will shortly be able to display signals broadcast by Flarm-equipped gliders, using a SkyEcho 2 ADS-B device. 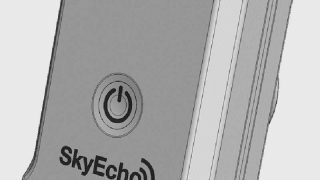 Tim Dawson, boss of SkyDemon, said, “Our agreement means that the SkyEcho 2 can receive the Flarm signals and pass them to SkyDemon in their raw form. We then decode them and feed the telemetry from the Flarm aircraft into our normal collision avoidance algorithms. 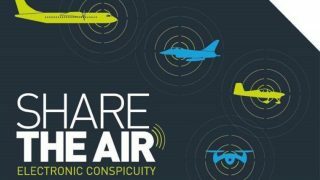 “As the pilot, you won’t need to know or care whether it’s an ADSB or a Flarm signal that has been received – you’ll be warned about any conflict regardless. The add-on will cost SkyDemon users who opt for it around £30 per year inc VAT, most of which goes to Flarm for licensing the functionality. 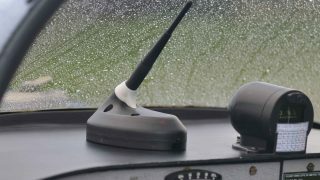 The SkyEcho 2 ADS-B device from uAvionix. 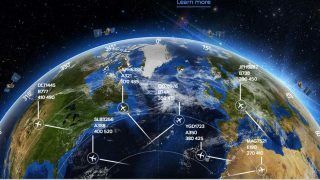 uAvionix, manufacturer of the SkyEcho ADS-B device, will start delivering SkyECho 2 carrying the Flarm capability within a few weeks. Existing devices can be upgraded with a firmware download at no cost. The next version of SkyDemon will contain the Flarm decoding ability. If a high percentage of light a/c have a Mode S transponder does this reduce the value of ADS-B since they will all have to switch off their ADS-B transmitter to prevent double contacts on ATS surveillance radars? That means that a/c with ADS-B receivers will only get a general indication that there is someone else in their vicinity rather the accurate indication of the other a/cs position they would get if the other a/c were transmitting on ADS-B. Is this a problem that is likely to be resolved in the near future? If not, I will hold off buying ADS-B for now. That’s the impossible call ……………………. no point being dead tomorrow having saved a few hundred quid today on a piece of kit that may just avoid the incident all together, if you don’t need it tomorrow you don’t need it today and the tax man can have it instead, well 40% probably!! I have had Monroy TAS mode A,C, & S for 10 years and now TRX1500a for Flam and ADSB as well and its scary of how much is in the Olympic area we never even see as very experience PPL’s. My advice is bite the bullet and have the peace of mind you have done all you can sensibly do to stay safe. Its cheap when compared to the value of your life and others who can then see you and no doubt to your overall annual cost of flying? That’s the impossible call ……………………. if you don’t need it today you don’t need it tomorrow but there is no point in being dead tomorrow and leaving a few extra hundred pounds in the bank and 40% of it for the taxman if a bit of kit could avoid the incident in the first place. I have had Monroy TAS for some 10 years for mode A,C & S and now TRX1500a for ADSB and Flarm and its scary what experienced PPL’s never see. My advice is go for it and have the peace of mind you have done all you can to stay safe by you seeing and also vitally be seen by others, your life is worth is worth more than a few hundred quid and no doubt its very cheap compared with your annual cost of flying. Couldn’t agree more with Steve Hayward’s comments. We have been encouraged, nay compelled in certain circumstances, to install Mode S transponders and also to go down the EC route with the use of ADS-B in/out equipment. Now we find that we have to disable the ADS-B out function of something like SkyEcho to prevent double targeting on ATS radars.